H2Q™ the Advanced Bioavailability Water Miscible CoQ10 from the makers of Q-Gel® that uses pure Hydro-Q-Sorb® CoQ10 – a Bioenhanced Coenzyme CoQ10, (Patent Number 6,861,447), – for enhanced dissolution and easier absorption is now available as a PURE Coenzyme Q10 powder which can be easily mixed with water, your favorite drink or even pudding. Each 75 Gram container holds a full 15,000 mg of pure Hydro-Q-Sorb® CoQ10. Each 75 Gram container includes a 1 gram scoop for easy measuring. Each level 1 gram scoop delivers 200mg of pure Hydro-Q-Sorb® CoQ10. H2Q™ CoQ10 Powder is 100% Natural. H2Q™ CoQ10 Powder is 100% vegetarian. H2Q™ CoQ10 Powder has NO artificial ingredients. H2Q™ CoQ10 Powder has NO Vitamin E.
H2Q™ CoQ10 Powder has NO Soy. 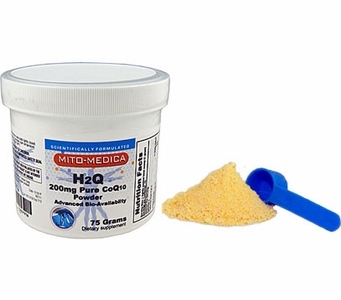 H2Q™ CoQ10 Powder is an All Trans CoQ10. H2Q™ CoQ10 Powder is a USP Grade CoQ10. H2Q™ CoQ10 Powder is non – GMO (NO Genetically Modified Organisms). NOTE: The Coenzyme Q10 utilized in the preparation of H2Q™ CoQ10 Powder has been self affirmed as a GRAS ingredient (USP Grade Coenzyme Q10). The gamma cyclodextrin utilized in the preparation of Hydro-Q-Sorb® in H2Q™ CoQ10 Powder has also been self affirmed as a GRAS ingredient (Wacker Biochem). All tests have detected that there is NO gluten, soy or casein detected in H2Q CoQ10 Powder. ** Percent Daily Values are based on a 2000 calorie diet. Your Daily Values may be higher or lower depending on your calorie needs. Free of: Sugar, yeast, wheat, milk products. No preservatives, artificial flavors or synthetic colors. Directions: Adults: Mix one (one) to two (2) scoops daily with your favorite drink, water, or pudding, as a dietary supplement or as directed by your healthcare professional.